If Donald Trump would like to see "Hamilton," the smash hit Broadway show that he has been criticizing on Twitter, he'll be able to snag tickets, even though it is sold out. And if he just wants to keep tweeting? Well that's okay, too. "I pray he keeps tweeting -- the show will sell out for decades, not just years," longtime public relations consultant Ken Sunshine told CNNMoney. Sunshine is one of the many investors in "Hamilton," which has become highly profitable by Broadway standards, something Trump might appreciate. On Sunday he tweeted that he has heard the musical is "highly overrated." It is actually one of the best-reviewed, most-awarded shows in Broadway history. And Trump, whose Trump Tower penthouse is one mile from the theater, is welcome to come see it, according to the show's lead producer, Jeffrey Seller. He told The New York Times that Trump is "welcome to attend." The production would likely find seats for the president-elect if he contacted the show -- like Pence did on Friday. There has been no request for tickets yet, however. "If he were really smart he would go see it -- like so many Republicans, like the Bushes, the Cheneys," Sunshine said. George W. Bush recently appeared in a PBS documentary, "Hamilton's America," about the show. President-elect Trump criticized "Hamilton" on Saturday and again on Sunday after his Vice President-elect Mike Pence was booed while attending Friday night's performance. After the closing number, Brandon Dixon, who plays Aaron Burr, discouraged any further booing and said to Pence, "We hope you will hear us out." "We, sir, we are the diverse America who are alarmed and anxious that your new administration will not protect us, our planet, our children, our parents, or defend us and uphold our inalienable rights," Dixon said in a prepared statement. "We truly hope that this show has inspired you to uphold our American values and to work on behalf of all of us." Pence said on "Fox News Sunday" that he "wasn't offended by what was said." As for the booing (along with some cheers) from the audience members, Pence said, "I nudged my kids and reminded them that is what freedom sounds like." But Trump fired off several tweets about it, saying on Saturday that Pence was "harassed last night at the theater by the cast of Hamilton, cameras blazing. This should not happen!" He called on the cast to apologize and reiterated that call on Sunday. People associated with the show have been floored by Trump's reaction. Sunshine, the president of the high-powered P.R. firm Sunshine Sachs, said, "I get the politics of him wanting to pick a fight with the creative community and people like me -- but he is so wrong about Hamilton. The show is a hugely patriotic comment on what America is supposed to be." Sunshine Sachs represents "Hamilton" creator Lin-Manuel Miranda, but Sunshine was speaking on his own. Miranda was busy all weekend on a press tour for "Moana;" he wrote songs and sang for the Disney animated film. But Miranda tweeted on Friday night, "Proud of @HamiltonMusical. Proud of @BrandonVDixon, for leading with love. And proud to remind you that ALL are welcome at the theater." 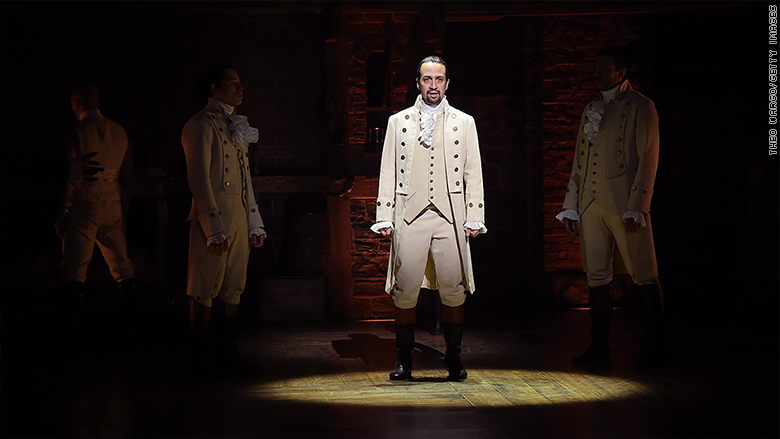 According to a spokesman for the production, "tickets to 'Hamilton' on Broadway are sold out through August 2017." Tickets re-sell on the web for well over $1,000. As for Trump, Sunshine quipped, "He couldn't be doing more to promote the show."